Now that the summer is over, my First Fridays Club is back in session. I missed seeing all my members’ happy faces, chatting with them, laughing with them. We have a lot of fun on Club Night. Last month we met for the first time and were happy to welcome some new members! Our group is getting bigger. Any bigger and I might have to offer two nights! I’ve just re-arranged my craft room/space so now I have my own room and there’s lots of space for others to join me for workshops and club night. I’ll post some photos in the future once everything in my new space is done. Here is the layout we did in September. Just click on it to see it larger. If you recognize it, it’s from the Cherry-O Workshop-on-the-Go, but I switched up the papers a bit. In fact, I used Twitterpated for the larger striped sections. I had so many people for our first club night, I had to switch up all the papers. There were lots of different versions of this layout as the papers were changed to use what I had on hand. Everyone got a bit of cherry paper, but we used different ones from Cherry-O. I had to take the light blue paper from all sorts of different kits; Sweet Home, Twitterpated, Emporium, and even Caboodle! 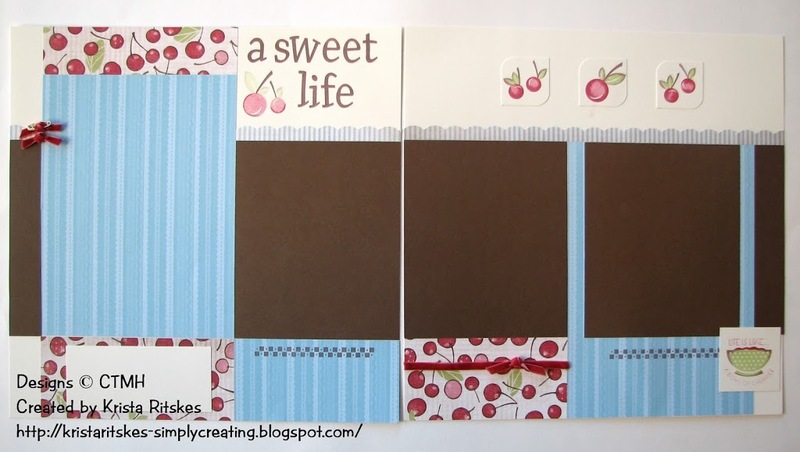 Everyone used the same stamp set (the one that comes with Cherry-O’s WOTG) and the same ribbon, which is actually from the Cherry-O Creative Basics kit. I added a little safety pin on the top ribbon on the left. Just a hint about this fuzzy ribbon. The knots don’t stay on very well with Glue Dots, but those puppies don’t move when you use Liquid Glass. Stay tuned. I’ll be posting October’s layout later this weekend. And just a quick peek at the layout we did at my Fundraising Crop. I’ll be posting more photos of that one soon, too. It’s Thanksgiving Weekend here in Canada, so Happy Thanksgiving to all my fellow Canadians!